Features Volant Air Filter Box: Our Cross-Link polyethylene box is engineered to each specific application for low restriction and an increase in air volume. It insulates and protects the filter from engine heat, moisture, dust and debris to provide colder air to the engine for an increase in horsepower. Volant Air Duct: Factory air inlet ducts use sound baffles and awkward bends which restrict flow. Our Cross-Link polyethylene air ducts are sculptured to give the engine less restrictive breathing. Incorporating larger diameters and unique bends, that can't be duplicated with metal ducts, allow for maximum airflow velocity and throttle response. -------------------------------------------------------------------------------- GM's engines are some of the best on the road. But Volant makes them better. Our intake system will improve MPG and horsepower. How? Our intake kits maintain a cooler air charge, gathering ambient air from outside the engine compartment. Cooler air is denser than hot air and gives your engine an oxygen richer charge to improve efficiency, leading to more power and fuel economy. 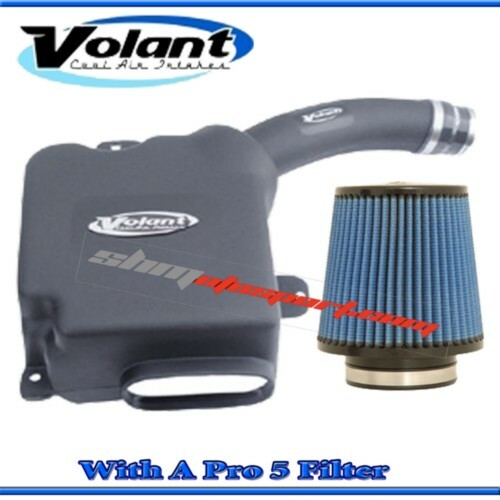 ========================= Volant Pro 5 Filter: Many of our intakes come with this cleanable and reusable high grade cotton filter media with five-layers of protection. It reduces air restriction and increases engine output by using precision pleat geometry, that optimizes airflow throughout the intake system. We recommend using Volant cleaning and oiling system for servicing the Pro 5 Filter. ========================== Volant offers Polished Aluminum or Carbon Fiber Look lids. (Some of our older applications and low production intake kits have the carbon fiber look lid.) Polished Aluminum Lid: Available on all Volant's popular intake systems, this embossed and polished lid features a high-grade neoprene foam backing for good sound insulation that enhances your engine compartment. Carbon Fiber Lid: Made from ABS plastic with a carbon fiber appearance for a custom look. This lid is included on older applications and low production air intake kits. High Performance Silicon Connectors: Our silicone hose connectors provide flexibility while maintaining strength and thermal stability. They won't crack or deform over time like rubber connectors. Stainless Steel Clamps: We only use marine-grade, stainless steel clamps that provide optimal performance to provide a solid seal that won't loosen or deteriorate.